A few weeks ago I had the opportunity to see a true country music legend at the Ryman Auditorium. I’ve only seen a handful of shows at the Ryman, but every time I step into that building I get such a feeling of awe and respect. Walking into the auditorium and sitting in those pews always brings me to think of all of the music legends that have played there. It’s one of my very favorite places in Nashville to see a concert because it is such an intimate atmosphere. On Saturday, April 15th I was there to see one of the great country music legends, Loretta Lynn, at a special celebration show for her 85th birthday. It was the first time for me to see her live and the entire night was absolutely wonderful. Mickey Guyton opened up the show and was fantastic. She introduced herself as Mickey as in “Mickey Mouse” and Guyton as a “guy” that weighs a “ton”. HA HA HA! Her entire set was great as not only were here vocals amazing but she had great transitions in between songs telling funny stories and interacting with the audience. Loretta Lynn’s granddaughters also came out and sang a few songs before she took the stage. 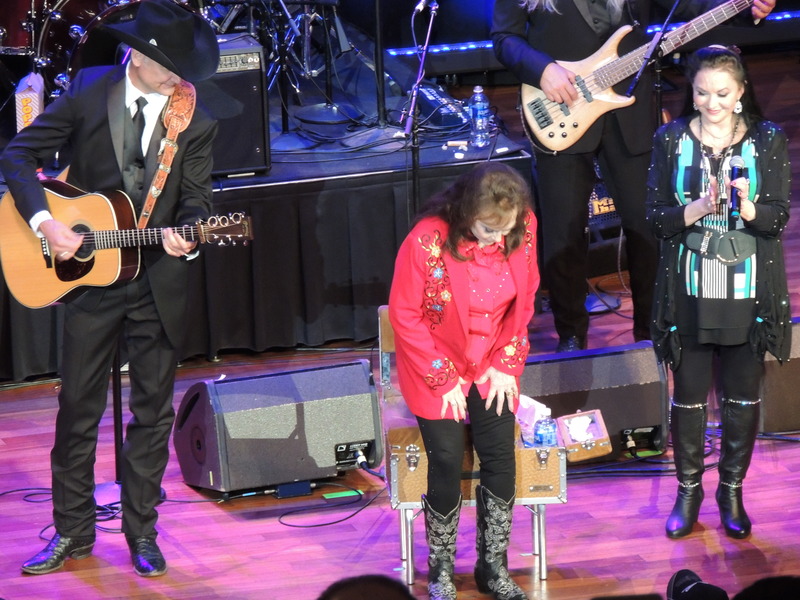 And finally Loretta Lynn took the stage to a standing ovation and for the rest of the night she sang hit after hit. Not only was the show entertaining for all of the classic songs that she sang, but she was absolutely hysterical with her witty banter in between songs. A few times during the night she told her band “hold on boys” because they had started playing the next song and she still wanted to talk! She also interacted a lot with the audience often asking “so what do ya’ll want to hear next?” after finishing a song. She sang with various special guests throughout the night including her daughter who sang one of her newer songs with her. They ended up laughing through a lot of it because she kept forgetting the words! BMI presented her with an award for over 2 million broadcast performances of ‘Coal Miner’s Daughter’. Before the night ended her sisters Crystal Gayle and Peggy Sue came out and sang with her. Crystal Gayle sang her hit “Don’t It Make My Brown Eyes Blue” much to the delight of the entire audience. She ended the night with “Coal Miner’s Daughter” and took a bow to another standing ovation.